Fukushima International Emergency: What Is The Solution? Now that the radiation levels in some zones of the Fukushima nuclear plant stand at 100,000 times above normal (latest revision), what avenues are left to solve this crisis? Should Japan seek expert international intervention because at these levels of deadly radiation most easy-to-deploy domestic solutions can no longer be implemented? 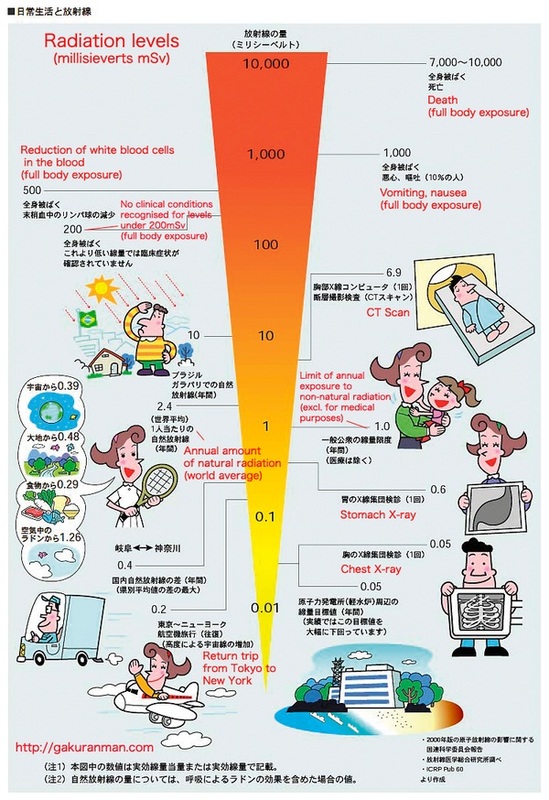 The likely human cost in terms of radiation exposure is too horrendous to contemplate in terms of land, sea and air intervention despite the joint efforts of the Japan Self-Defence-Force and the US military. The alternative may be to deploy robots but at this heightened level of radiation even their software-driven semiconductor brains could malfunction. Leaked water outside nuclear reactor number 2 is emitting 1,000 milliSieverts per hour (mSv/hr) -- 100,000 higher than normal -- according to the latest revision by TEPCO (Tokyo Electric Power Company). That’s higher than the dose that would cause vomiting, hair loss and diarrhoea, according to the World Nuclear Association. The US Environmental Protection Agency says a dose of 1,000 milliSieverts is enough to cause haemorrhaging. Current average limit for nuclear workers worldwide is 20 mSv/year. So an emergency worker at the Fukushima nuclear plant's affected zones may be exposed to 50 times more radiation in one hour than s/he is safely permitted to absorb in one year per international regulations. The Japanese government and TEPCO have elevated the limit for Fukushima emergency workers to 250 mSv/year and even that exposure limit is likely to be crossed in just 15 minutes at this extremely high level of radiation. This makes it very difficult to carry out emergency work at the nuclear plant, hence the workers have had to be evacuated. This crisis is rapidly approaching the dimensions of Chernobyl in 1986, although it appears that the Japanese authorities have so far been reluctant to raise the threat level. The criterion for relocation after the Chernobyl disaster was 350 mSv/lifetime which would be reached in around 20 minutes at the present radiation levels near some of the zones at the Fukushima nuclear plant. We have published a number of ATCA briefings about this unfolding nuclear crisis in Fukushima since its very beginning. Our very first red alert in regard to this nuclear emergency was issued on 11th March, the day of the Tsunami in Japan. We have been concerned about the Japan-specific and global implications of this crisis because of the radiation exposure for ordinary citizens and workers; food and water contamination; vast spent fuel pools carrying many decades worth of used fuel rods; as well as the Plutonium MOX fuel rods at reactor 3, which is one of the deadliest substances known to humankind. We suggested the need to deploy the Chernobyl option of pouring concrete over the reactors on 19th March, more than one week ago. In view of the high level of radiation now being emitted by the Fukushima nuclear plant, is the Chernobyl option still available? A stitch in time saves nine. There is a continuing mismatch between the hidden expectations of the Japanese authorities to be able to contain this problem and the cascading nuclear crisis. Many nuclear experts around the world, including those within the ATCA 5000, have suggested the need for urgent action to entomb these reactors in concrete, yet the Japanese authorities have continued to resist that solution. This may be, in part, because of a potential stigma that such a solution carries in the Japanese psyche which amounts to a tacit admission of failure and defeat. The Japanese are justly proud of their achievements and do not like to give up easily. We have to recognise that what needs to be done on this occasion has never been attempted before and even the Chernobyl option is transitionary in the longer term. Given these complex challenges, we extend our prayers and sympathies to the people of Japan and show solidarity with them in their hour of need. If anything we have written causes upset, then we seek to apologise in advance. 22nd March Japan Nuclear Crisis: What About The Plutonium MOX? 19th March Fukushima: How To Avoid A Potential Chernobyl? 17th March Japan Systemic Risk: Global Financial Meltdown?